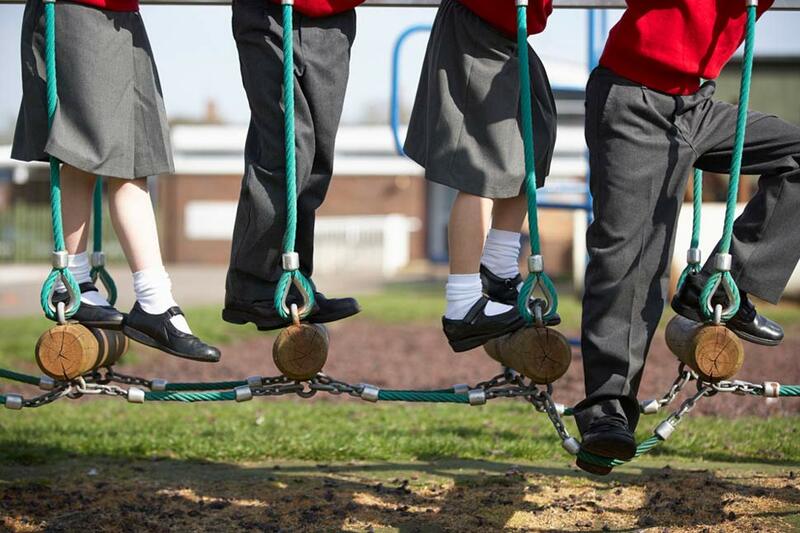 As mornings get darker and afternoons get shorter, resident Proviz nutritionist and mum of three, Issy Lowndes, looks at what you can do to keep your kids safe if they’re walking to school. Are you noticing that when you draw the curtains in the morning you feel like you should be getting back into bed because it is not quite ‘morning enough’ to be getting up? Autumn and winter hold some wonderful things, but the shorter days are full of challenges – safety and visibility being two of them. This is especially true if your child walks to and from school – either on their own or with you. It is essential that everyone can see them – drivers, motorcyclists, cyclists and even other pedestrians. Add in a scooter or a bike and the variables soon rack up. 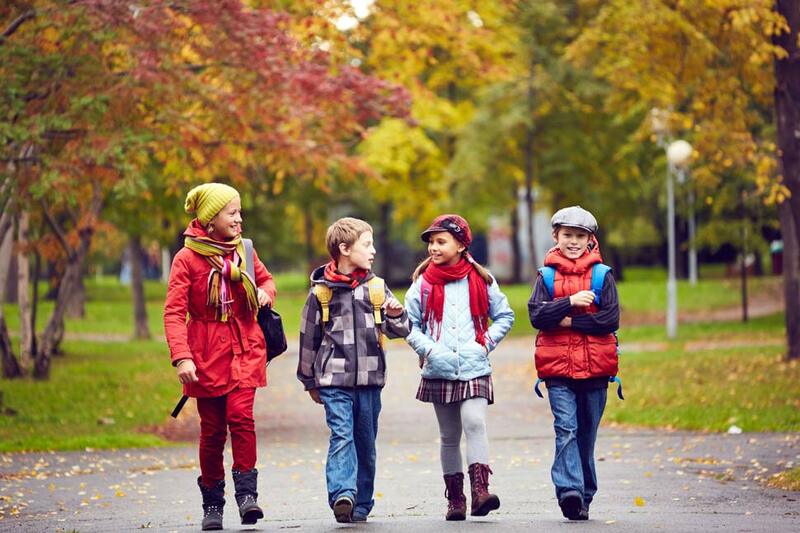 That doesn’t mean you should stop walking to and from school – it is such a great way to make sure kids get some fresh air and exercise – but it’s worth putting a few things in place to help keep them protected. I know I have been caught out by fading light in the past. I’ve picked up the kids from school – one in a buggy and two on scooters (this after much pleading that I bring their scooters at home time) – and by the time I finished talking to other mums, collected all of the children’s belongings, hung it all on the buggy, the evening had already started to set in. The kids’ school uniform is dark, their coats are dark, their hair is even dark….we were lucky to get home in one piece. Just like adult cyclists, runners and commuters, it’s worth investing in some kit that can help boost your children’s chances of being seen by other road users. For starters, no black coats. 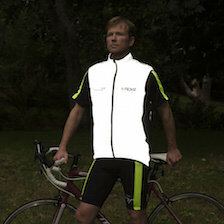 High visibility colours are good for daylight hours, reflective is better in the dark. 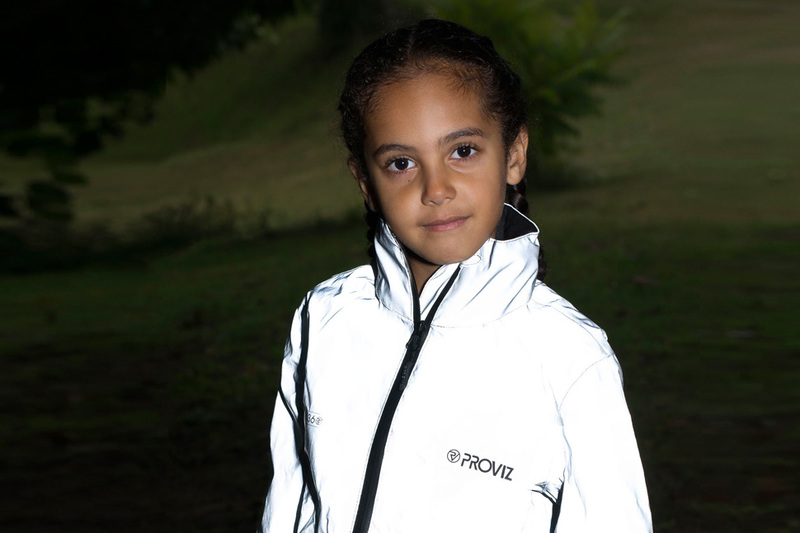 That’s why Proviz developed a junior version of its best-selling REFLECT360 jacket. 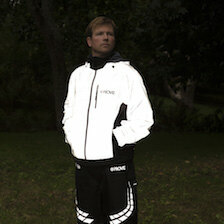 I know from experience that kids love the fact that when they wear the jacket they literally ‘glow in the dark’. 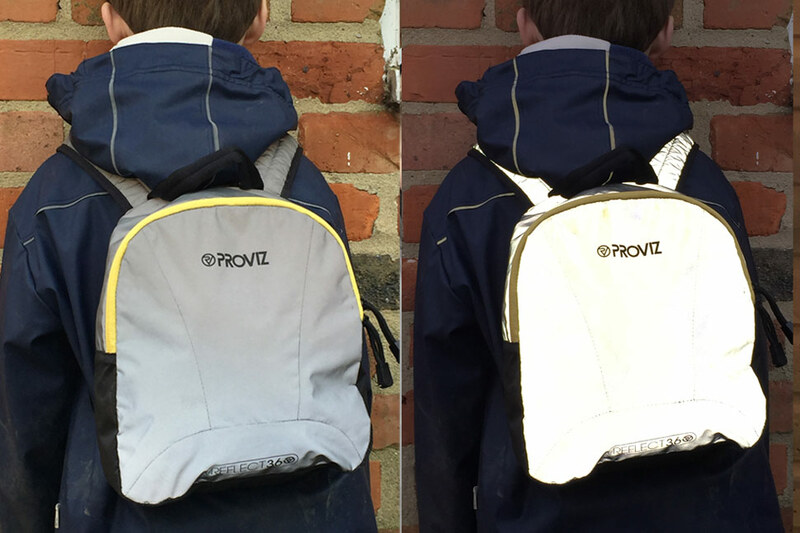 Backpacks – lots of kids use backpacks for school books and kit and the Proviz REFLECT360 backpack is a great accessory that can help make sure your child is seen from behind. It’s worth teaming it with something visible on the front, as well, such as a light band. Reflective or highly visible backpacks are particularly good for children on bikes or scooters. 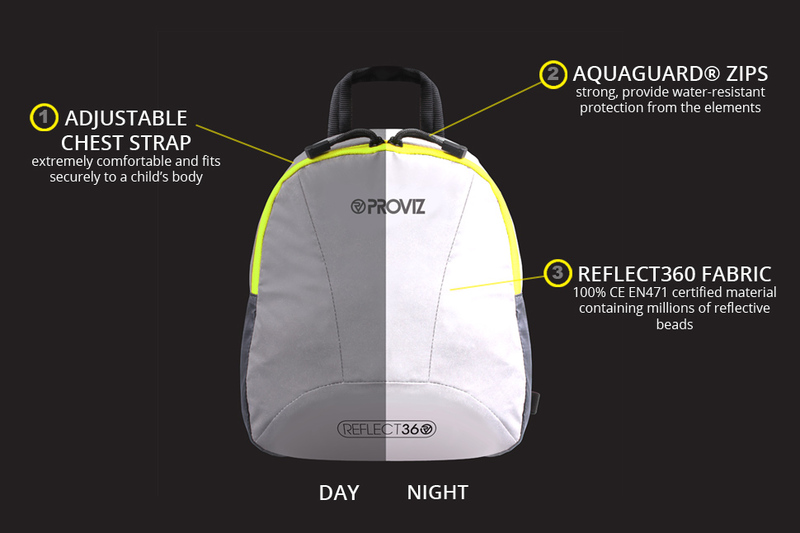 The Proviz backpack comes in two children’s sizes – small and large – is waterproof, has great pockets, and is really comfortable to wear. If your child insists on having the latest Disney character backpack or, more importantly, the school wants you using their branded backpack, why not invest in a reflective backpack cover for those darker evenings and mornings? 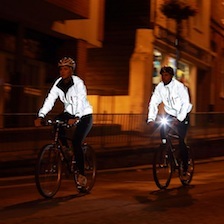 Reflective light bands - The Proviz LED armband is completely adjustable so can be used by all the family. They give out a very strong light thanks to two compact CR2032 batteries that power two super-strong LED lights situated on each end of a flexible silicon tube. The whole tube glows brightly to give you a night-time visibility boost. It can be attached to bags and backpacks and could even be used as a dog collar! Reflective helmets if your child is using a scooter or bike – the Proviz REFLECT360 helmet is ideal for making sure you can still see them as they speed ahead. 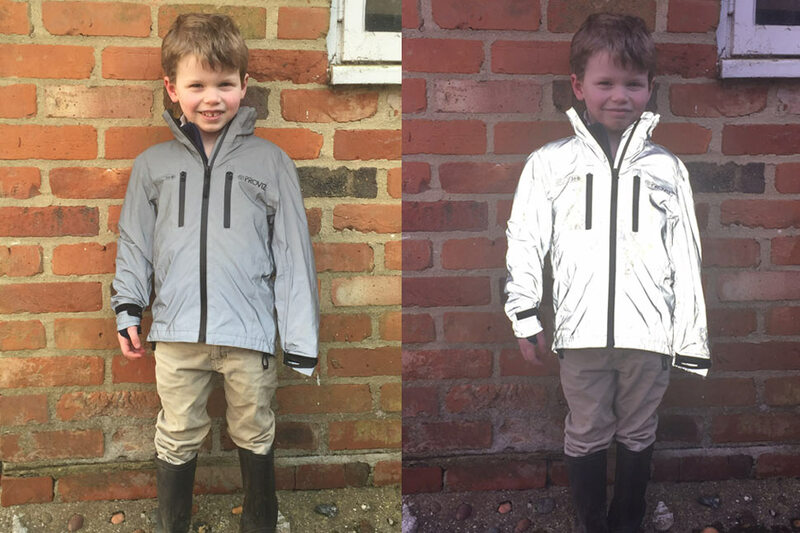 The REFLECT360 Children's Outdoor Jacket is the world's first to be manufactured using 100% reflective material. Be Bright Be Seen – one of a series of games designed by the British Department of Transport to help kids learn about the importance of staying visible in the dark. Road Safety Week Global Hub – Road Safety Week takes place in November and this site has loads of great resources to help you or your school put on awareness events. Sustrans – this charity’s remit is to make it easier for people to walk and cycle and has some great tips on how to teach your child about road awareness. And, Don’t forget the dog! The trip to and from school can be a great opportunity to walk the dog, so why not invest in a Proviz REFLECT360 waterproof dog coat? The coat was created after requests from customers, including one whose pup slipped his leash while out at night and ran into the road. 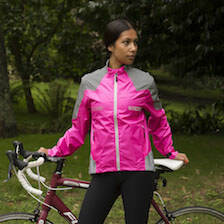 The customer was wearing his Proviz REFLECT360 jacket, which caused a driver to stop because of the movement. However, the driver had not seen the dog.